Testimonials – Michael S. Fozo, M.D., F.A.C.S. Almost exactly a year ago I went to see Dr Fozo for rhinoplasty and chin lipo. He reduced my nostrils and took cartilage from the tip of my nose and built up the bridge and added some length to the tip. It was not a dramatic change, just enough to balance things a bit better. I didn’t have any bruising whatsoever and the only pain throughout the whole process was the removal of the stitches (apparently I am a quick healer). I have a slight scar in between my nostrils but that is it. I was concerned about having this surgery in my 40s (I was 42 at the time), but I am so happy with the results. I wish I would have done it 20 years ago. -Beth. Rhinoplasty/Chin Lipo Clinton Twp, MI. 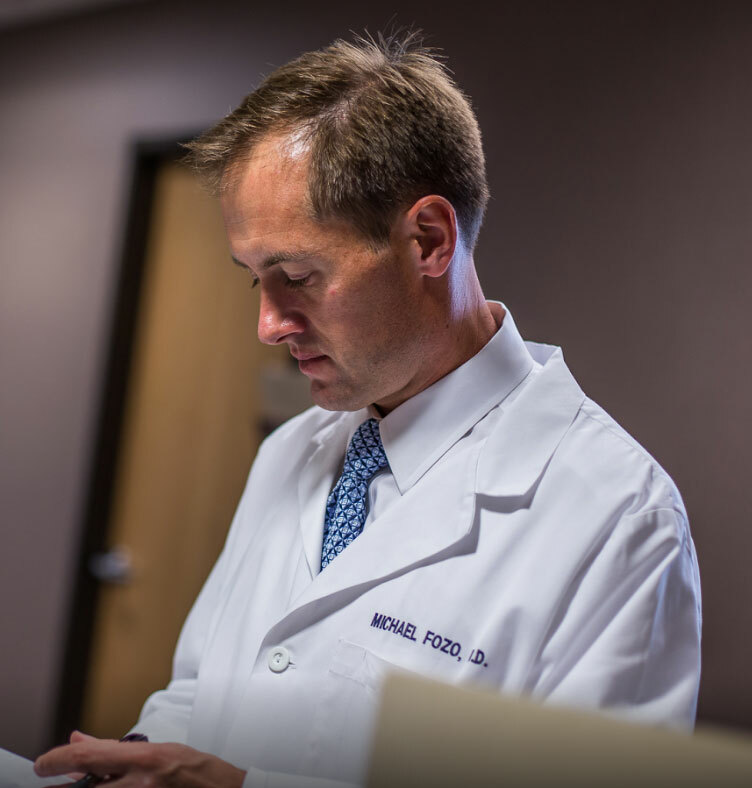 Dr. Fozo made me feel comfortable with the entire process from the very beginning. There can be a lot of questions and apprehension as a new patient considering surgery. However, all of my questions were answered and I was left with complete faith and trust in Dr. Fozo and his team. Dr. Fozo gives you the results that are best for you — without giving a generic, “cookie cutter” appearance. I couldn’t be more happy with my results! I had previously used Dr. Fozo for a nose job. I was extremely happy with the results. So much so that I chose Dr. Fozo for my facelift as well. The results were, I — a 51 year old woman — was asked for identification to purchase alcohol. I cannot thank Dr. Fozo and his staff enough for their professional behavior and excellent results. I would and have recommended Dr. Fozo to friends and family. My nose surgery, performed by Dr. Fozo, changed my life. I love my new look, and my confidence shines everyday! Thank you so much Dr. Fozo for being patient, professional and a great surgeon. I would not have changed anything about my experience. I recommend this office for its friendly staff and amazing work. Thank you so much for all your wonderful care, I could not have asked for any better experience than I’ve had with you. Your professionalism and friendliness made my surgery experience much better. The work you have done has truly changed my life. I appreciate all you have done for me! Thank you from the bottom of my heart. I am glad that I selected Dr. Fozo as my surgeon. He is an ENT surgeon focusing on facial plastic surgery, unlike most plastic surgeons and clinics offering all surgeries. The whole process was very satisfying; he earned my trust early in our communications. I will recommend Dr. Fozo to anyone who is interested in cosmetic refinement of their nose, and expecting a change that is beautiful and natural in appearance. My concern was to avoid telltale signs and scars of plastic surgery. I was looking for a surgeon who is artistic, who makes improvement to the nose without creating new concerns (overly done). Dr. Fozo has that approach. When I browsed Dr. Fozo’s work (his other cases), results were unique and the change fit in well naturally. During my consultation, Dr. Fozo accurately assessed my facial profile and provided computer generated after-surgery images, which was a plus. The actual after-surgery profile is even better. He has excellent communication skills, not a single question unanswered, so does his staff. Within couple of weeks after the surgery, once the bruising and swelling decreased, my sis sent me a note saying that the Doc’s work was million dollars perfect! I am very happy about the result, no unsightly scars. I look forward for more pleasing result once all swelling subsides. He also has a very admirable and confident personality, and exhibits great professionalism. Will recommend Dr. Fozo to anyone interested in Rhinoplasty. Dr. Fozo is an all-around fantastic doctor. From the consultation to the post-op, I have been completely happy with my decision to choose him as my surgeon. He didn’t just think of how my nose would look immediately after the surgery, but more so how it will continue to change through the years. I’m thrilled with the natural results of my septo/rhinoplasty. I can finally breathe easily through my nose and I’m 100% more confident in my appearance. I have and will continue to recommend Dr. Fozo to friends and family who are interested in any of his services. Coming into this procedure (deviated septum & crooked nose)I was very skeptical considering I had taken 2 opinions prior to Dr. Fozo’s. Both opinions didn’t seem realistic. But still the third opinion I came in with a positive attitude considering i had researched Dr. Fozo’s work from this site. Since September of 2005 i have been extremely happy with the results. For one I can breath very clearly. Secondly the appearance as well as my self esteem regarding the appearance of my nose has changed drastically for the good. The appearance that was once shifted to the left is now centered straight. All in all I’m extremely happy with the results. Dr. Fozo removed a parotid tumor from my left lower ear area. He did an excellent job and the scar is barely visible. He has a calm bedside manner and made me feel that my case was important to him. I was impressed with his staff and assistants. He took the time to answer all questions and returned phone calls in a timely manner. Wonderful!